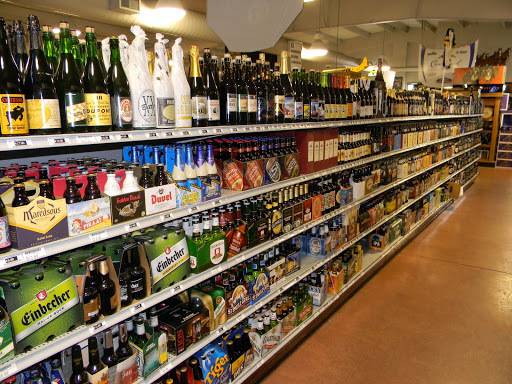 Beer Shopping | Beer Apprentice - Craft Beer News, Reviews, Interviews and Info. Hi guys. Instead of a craft beer review today I thought I would change it up a bit and give you a little tour of this new bottle shop that I’ve been going to lately. 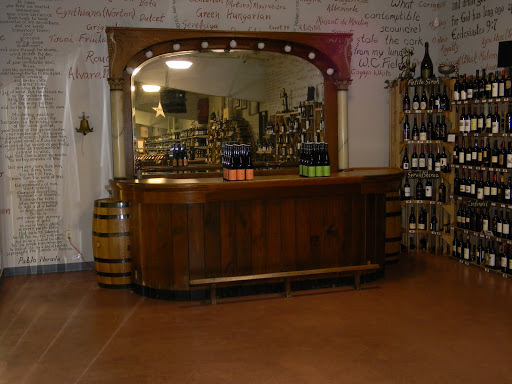 The place is called Wino’s Depot and it is located at 2440 Nashville Rd. Ste 103 in Bowling Green, KY.
You guys may recall that I wrote a piece about Chuck’s Wine and Spirits (also located in Bowling Green) a little over a year ago. 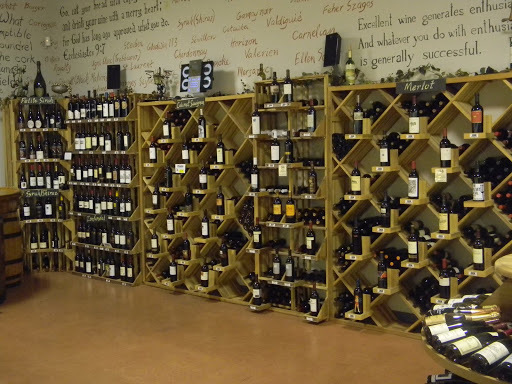 That particular store had been my primary place of business for quite some time, however since I found out about Wino’s, all that has changed. I would say that the main reason I explore Wino’s now instead of Chuck’s is that Blake Layne, who used to be employed at Chuck’s and oversaw all of the beer and wine there, is now part owner of this new facility. He basically invited me to come and take a look around at his new adventure…. so I did…. and boy, was I glad I did. Now, when I first arrived they weren’t even officially open for business. I walked through the door sometime before Christmas, yet they didn’t have their official opening until sometime in January. None the less, I could still tell that this place was going to be something special and a place that I would want to come back to on a regular basis. Every time that I have visited since they have made subtle changes and continued to bring in new and outstanding product. During my most recent visit (May 25th) I thought I would take my camera and snap a few pictures to give you an idea of what kind of place I have the privilege of frequenting regularly now. As customers walk through the front door they are greeted with a very inviting lounge section and faux fireplace for relaxing conversation and contemplation of their chosen beverage. As one rounds the corner of the bar they are greeted with this wonderful sight!!! Twenty taps that are constantly being rotated for growler fills, samples, pints and snifter pours. For today’s visit I chose the Dogfish Head 120 Minute IPA. Mmmm…. delicious. Blake then asked if I would like to see the cooler. Can you say, “controlled chaos”? All of those barrels stacked on top of one another was definitely a beautiful sight. 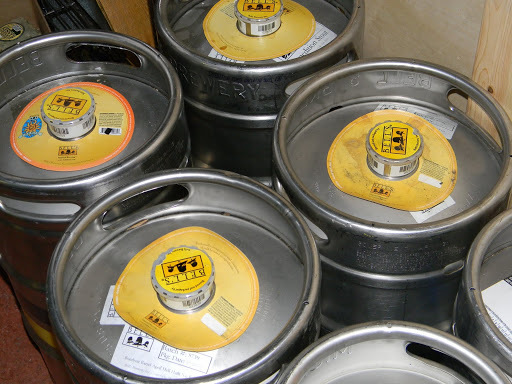 After taking a peek at those kegs I wanted to start shopping for myself and needless to say…. they had plenty for me to choose from. 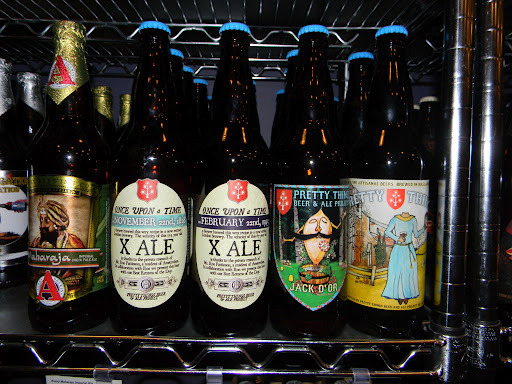 Considerable choices from Jolly Pumpkin…. As well as several of the Trappistes offerings. 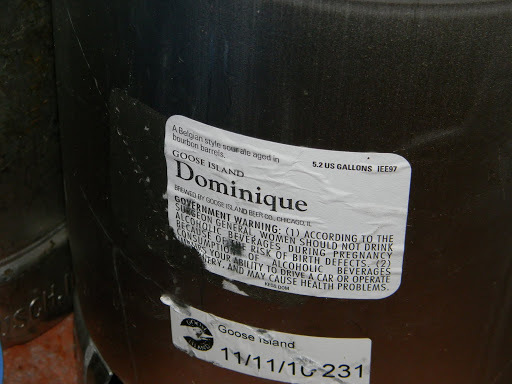 Some tasty favorites from Fantome…. And just within the last few months, Sixpoint Brewery has made it to our area. Quite a few Mikkeller brews are always available too. Another brewery that I’ve been exploring lately has been Mahr’s Brau. Also, here are a few different bottles from Pretty Things while an Avery Maharaja eases into the picture. 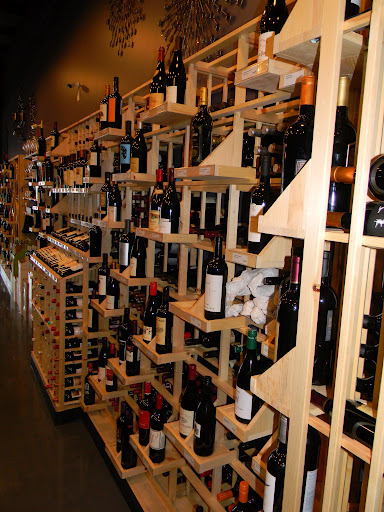 Not only do they sell amazing craft beer, but the wine selection is top notch as well. How ’bout a small, but solid selection of cigars? 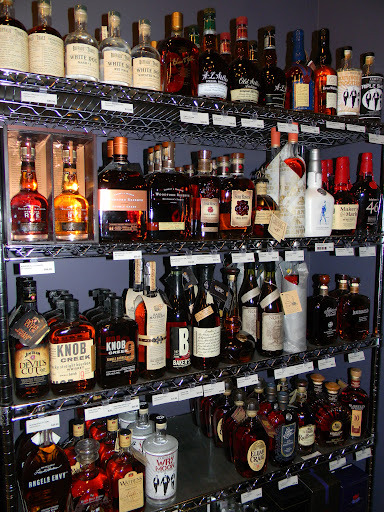 And what trip to the Bluegrass State would be complete without checking out some of the world-class varieties of Kentucky Bourbon/Whiskey? Granted, Wino’s Depot is still in its infancy, but I have no doubt that this could be THE place to visit when shopping for craft beer, wine and spirits in Kentucky. They pride themselves on quality not quantity. One of the most amazing things about the store is that they do absolutely no advertising aside from posting on Facebook. 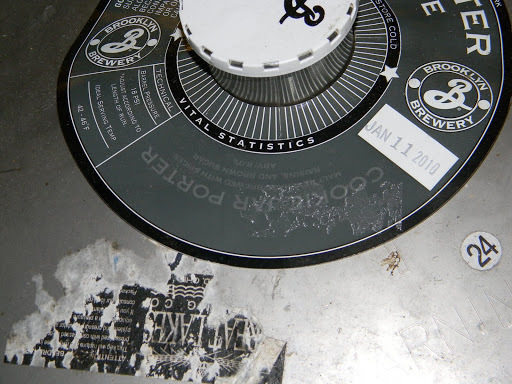 Why, the day I visited, Blake put Three Floyds Dreadnaught on tap, made a quick post and, literally, within 15 minutes people were walking in asking for snifter pours. And you never know what kind of beer geeks you may run into there. 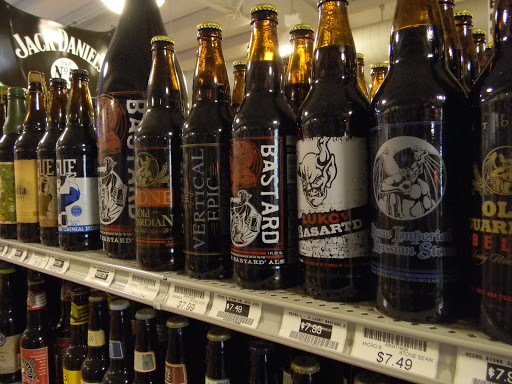 I’ve only been there about 4 times in total and have met distributors from Stone, Three Floyds and Goose Island. 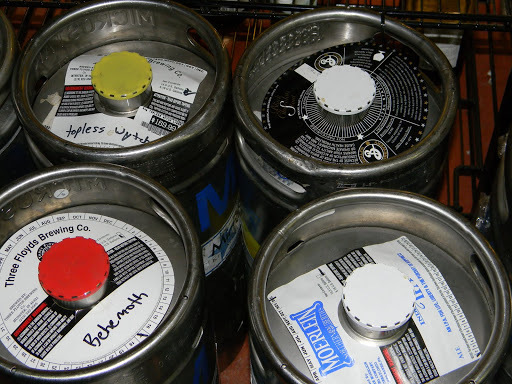 Different breweries are planning on doing several tap “takeovers” as they go along as well. 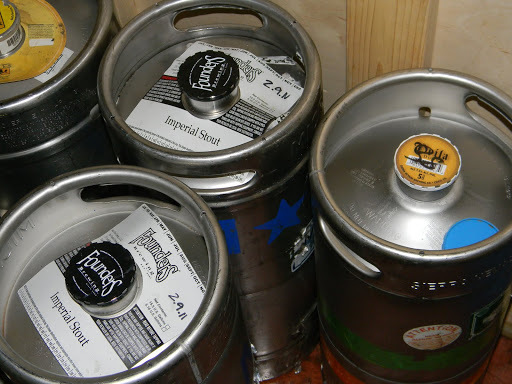 Some big dogs like Founders, Bells and Schlafly have already made arrangements to showcase their brews. So, if you guys ever happen to be in the Southern Kentucky town of Bowling Green, be sure to stop by Wino’s Depot, take a look around and pick up a bottle or two. Ask for Blake Layne because he is sure to be able to answer any questions you may have and provide a little something to satisfy any beer need. I want to thank Blake and all of the employees at Wino’s for making me feel welcome and for allowing me to take a few pictures for you guys. I’m already looking forward to my next road trip to Bowling Green to see what new and unique beers I might run across. I love beer shopping. Not much left to say about it really. I can’t tell you how excited I get walking through the store and picking out what I want. Just like when I was a kid wandering in and out of candy stores trying to decide what kind of “goodies” I could find. I get almost giddy days before I know I’m going. What cool treats will I come home with this time? I live in a “dry” county, so it’s not like I can just get in the car and take a trip to the corner when I get a hankering for some good beer. The closest place for me to get well made, “craft beer” is in this small Southern Kentucky town. Now, Bowling Green is approximately 50 miles, one way, from where I live. It literally turns into a planned event that takes up half my day when I decide to do some “pickin’.” When I do make the jaunt, which is about once a month, I stock up!!! I will always pick up a few of my favorites plus grab a few bottles that I have never tried before. I am like a kid anticipating Christmas when I make the trek. I can’t wait to see what’s new on the shelves. There are a few establishments in Bowling Green to get craft beer, but the only places I ever visit are the Chuck Evans Liquor Outlets. They have been in business since 1976 and currently have 4 stores in the area, however the most spectacular establishment was opened in 2001 and is located at 386 Three Springs Road, right off I-65. That’s where I’m headed. On this particular trip, I thought it would be interesting to take my camera and snap a few pictures to give you an idea of what I get to see and some of the choices I’m faced with. Now, I was unsure of how management would react when I walked in carrying my “lens.” I guess the worst thing they could say would be, “Not a chance, Bud!! !” It was worth the embarrassment, I thought. I will do my best!!!! 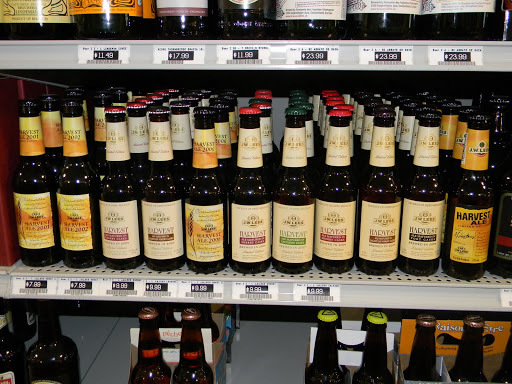 The craft beer isle is chocked full of various singles along with 4, 6 and 12 packs. 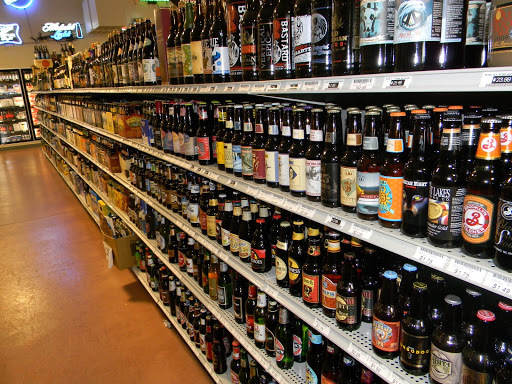 Just about every brewery has graced these shelves in one form or another and at one time or another. The store has implemented a great little tactic of “create your own six-pack.” Which, works well for me when I’m reviewing beers. If I run across one I don’t like. I’m only out one beer. It’s a win/win situation. As you can see from the picture below….. The choices are almost endless. Some of my personal favorites and “go to” beers from Sierra Nevada, Rogue and Stone. Yumm…. delicious!!!! 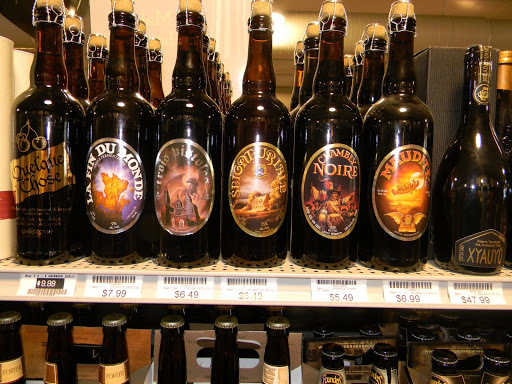 Some excellent choices from Unibroue. 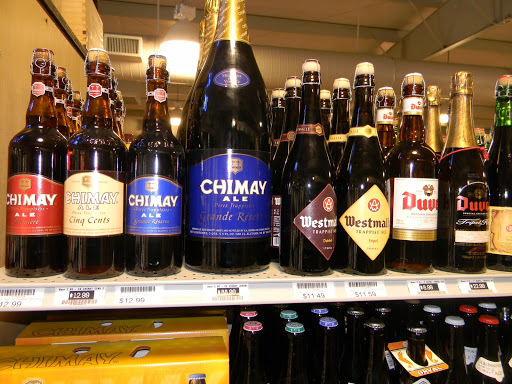 Chimay, Westmalle or Duvel anyone????? 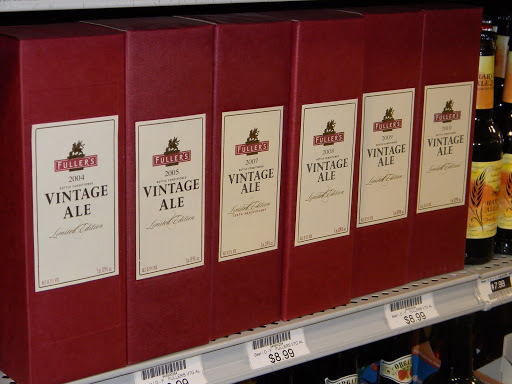 A plethora of imports tempting the customers…..
Fullers Vintage Ale: 2004 – 2010. Nice!!! 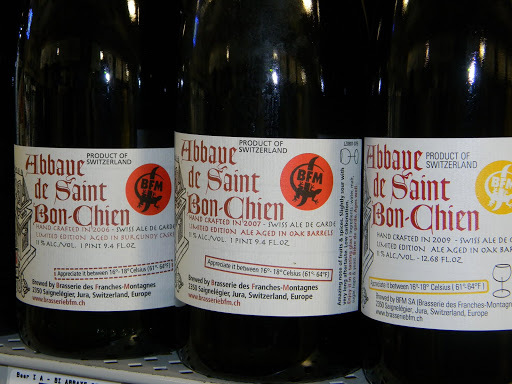 Switzerland’s own handcrafted Abbaye de Saint Bon-Chien. ’06, ’07 and ’09. A world class selection of J.W. Lees Harvest Ale. Wow!!! Now before I go any further I must introduce you to Blake Layne (“Steamhead” on BeerAdvocate.com if anyone is interested). 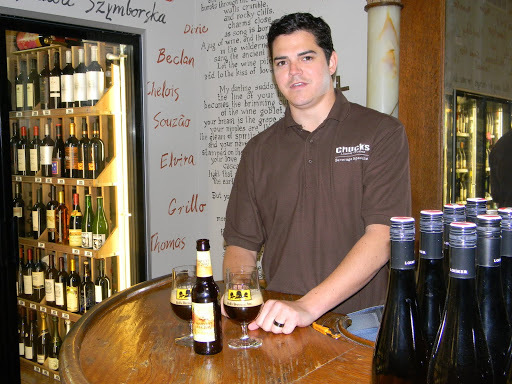 He has been serious about craft brews since 1999 and has been with Chucks for the past eight years. I have had the opportunity to meet Blake a few times and believe me, if you haven’t had that chance, it’s almost worth the trip to Bowling Green just to pick his brain regarding all things craft beer. He is a Certified Specialist in both Wine and Spirits and is currently working toward his Certificate in Winemaking through UC Davis. He has been a homebrewer for 12 years and is a member of CASK (the Cranky Alers of Southern Kentucky). Besides that, he is a walking encyclopedia of knowledge on all things craft beer. This is going to be a treat. Here are a few of the items that he profiled. 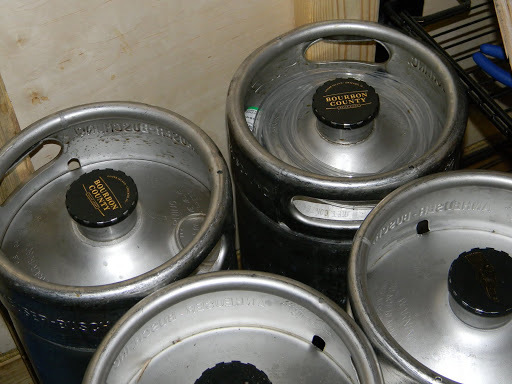 How about a couple kegs of Founders Imperial Stout and a Sierra Nevada Ovila Dubbel? Is Bell’s more your style? 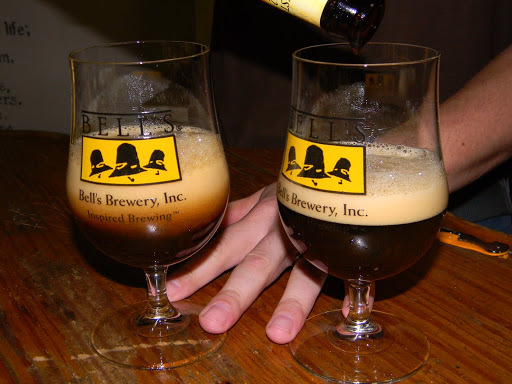 Oberon or Expedition Stout? 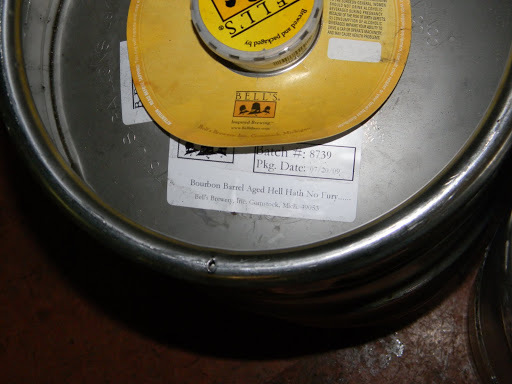 A tantalizing Bell’s Bourbon Barrel Aged Hell Hath No Fury. Three Floyds, Brooklyn Black Chocolate Stout and Moerlein IPA. 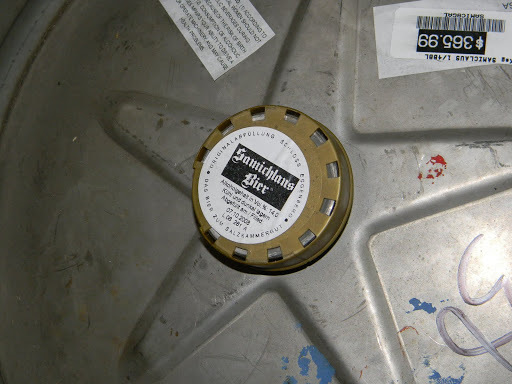 Austria’s Brauerei Schloss Eggenberg Samichlaus Bier. 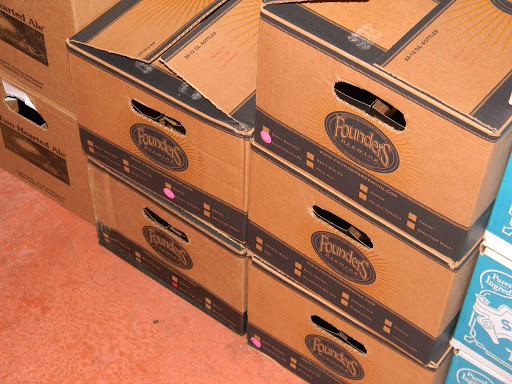 Fresh cases of Founders Centenial IPA and Double Trouble along with Bell’s Two Hearted Ale and Sierra Nevada Torpedo. Finally, quite possible the establishments most prized possession at this time…. A cask of J.W. Lees Vintage Harvest Ale 2009. I’m not at all a wine connoisseur, but I couldn’t help notice the exquisite selection. 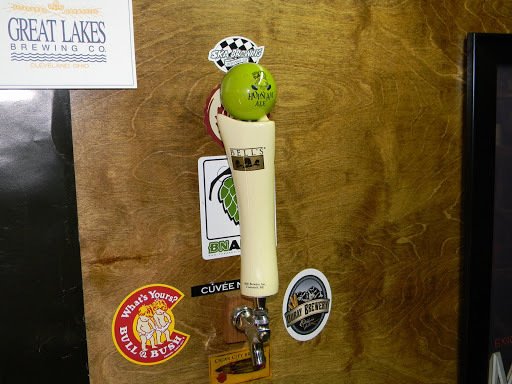 How ’bout a funky, little Bell’s Hopslam tap handle? After I had my private tour, Blake asked if I would like to sample a brew. I, of course, said, “Sure.” He proceeded to pop the top on, what else? A J.W. 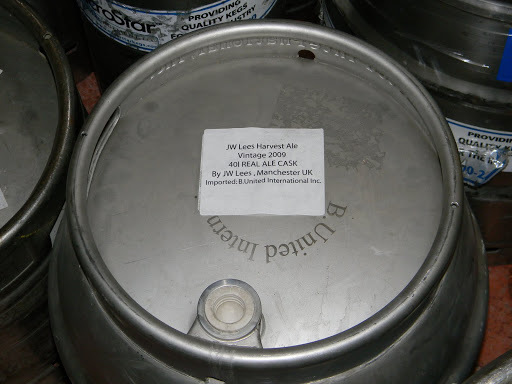 Lees 2002 Vintage Harvest Ale!!! 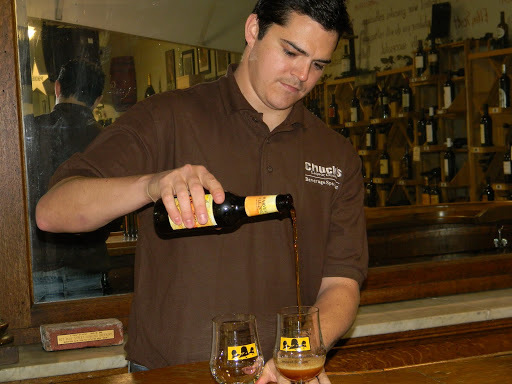 Here’s Blake demonstrating the proper pour. Coaxing the last drop from the bottle. As we sipped and pondered the brew, Blake said, “What’s better than sipping a J.W. Lees at 11:00 on a Friday morning with Van Morrison on the stereo?? ?”……… I would have to say….. “Not much.” Cheers. Tastings are a common thing at Chuck’s. 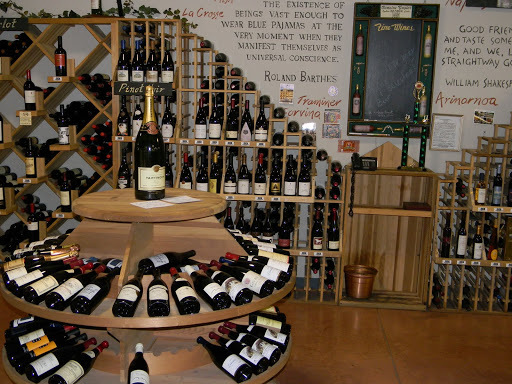 Wine tastings are held every Friday and Saturday from 4-6 p.m. cst. Beer tastings are by announcement. 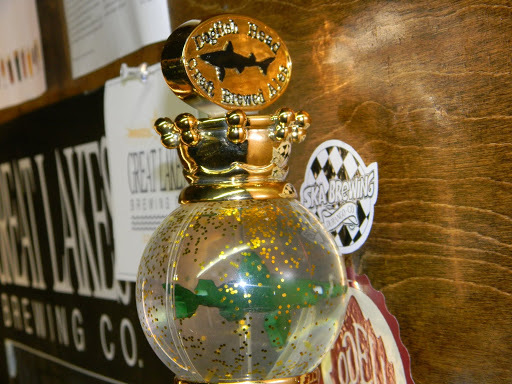 Last year they were the first retail store to host the Goose Island Beer Academy and they also hosted a Sierra Nevada 30th Anniversary Celebration tasting. Not bad for a small town store, ‘eh? Before I left, Blake made a point to tell me that one of the most important aspects of the store is to keep things fresh. No out of date or “skunky” beer here. Always ripe, prime product. If it’s not, “send it back,” he said. As I was walking out, I made sure to thank Blake and Shelby for the opportunity to get an insiders look at the operation. I can’t stress enough how much I appreciate what they and the rest of the staff at Chuck’s do for the consumer. I already can’t wait to go back. I have only been enjoying craft beer for about 4 1/2 years, so I still have a lot to learn and a lot of beers to try. One fact that I have realized is the old adage of, the more you know… the less you know. That has never been more evident, in my case, regarding the world of craft beer. Each visit to Chuck’s gives me a little more incentive and desire to expand my knowledge as much as possible about this art. Without the help of good folks like Blake and Shelby, I would be lost. Thanks again guys. It was truly a great experience. The bounty I brought home. Needless to say, it was a good day.